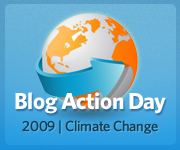 A few years ago, I wrote a post for Blog Action Day presenting ideas for creating art in more environmentally friendly ways – Making Art Without Unmaking the Environment. Art supplies and other byproducts of our work is notoriously toxic. Just like businesses and construction are changing to be more green, artists must update their ways of working as well, to minimize their long term affects on our planet. But artists are more than businesses manufacturing a product. We are cultural messengers. We are here to speak about and reflect things that are important to us and our cultures. One common message we have been signaling, regardless of our country or medium, is that we must pay more attention and care to our planet. The Earth’s climate is changing, and we must take action to stop or reverse it. According to the United Nations, “There is alarming evidence that important tipping points, leading to irreversible changes in major ecosystems and the planetary climate system, may already have been reached or passed.” The Earth is the only home we have, along with the millions of other species who share it with us. If you disagree with the idea that the climate is changing, or that humans are causing it, I would only ask you to consider the odds and the consequences. Many scientists believe this is happening and it is caused by human action. But what if you’re right, and it was only a 50/50 chance we were responsible. Do you think humanity’s fate, and the fate of many other species, should be decided by the toss of a coin? So what are artists doing to make a difference? Here are some stories about artists affecting our collective approach to climate change through their work. There are many great stories of well known musicians and filmmakers putting together concerts, films and other events to make a big difference. But I wanted to shine a light on people you might not have heard of. Early artists key to Yellowstone Park’s preservation, helenair.com. The paintings of Thomas Moran and photographs of Henry Jackson were critical to the U.S. Congress creation of Yellowstone, the first national park. In 2005, Grist pleaded What the warming world needs now is art, sweet art and four years later, followed it up with Climate Art is Hot. SEED Magazine says The Arts Community is Responding to Climate Change, and Changing the Conversation in the Process. Green Theater Initiative talks about Addressing Climate Change One Theatre Artist at a Time. Here is an entire episode of the PBS series Art:21 devoted to Ecology and art. Climate Change Education has a great Media and Arts section, including great lists of artwork and artists broken down by discipline: painting, sculpture, video and new media, and more. Now, how can you make a difference? Here are pointers to more information about grants and funding, exhibitions, shows and more. If you know of other resources, or other stories about artists making great work, post a comment below and I’ll continue to update this post. Green Museum informs, inspires and connects people through environmental art and encourages the creation of new work that serves communities and ecosystems. Ars Natura, nature in art, art in nature. Strange Weather, a resource hub about climate change for artists, writers and activists. Landscape and Arts Network brings together landscape architects, engineers, architects, artists, educationalists and ecologists who feel passionate about improving and sustaining the quality of our urban and natural environment. Free Soil, an international hybrid collaboration of artists, activists, researchers and gardeners who take a participatory role in the transformation of our environment. Ear to the Earth heightens environmental awareness through sound, inspires engagement in environmental issues, and sustains engagement through ongoing activities. The website is a forum for composers, sound artists, and everyone interested in sound to listen and participate. RANE – Research in Art Nature and Environment actively seeks creative methods through which art can impact on our current environmental predicament. Using artistic practice the group aims to offer interpretations and models of thinking about the natural world that help to promote a sustainable future. Eco Arts Online brings together science, environmental, arts, indigenous, and other organizations to offer you a wide variety of events – performances, exhibits, talks, tours, films, fairs, and more. The Ashden Directory, bringing together environmentalism and the performing arts. Participate or Die, Wooloo.org. Wooloo.org is organizing the people of Copenhagen to open their homes to thousands of environmental artists during the United Nations (UN) Climate Change Conference in Denmark this December. By asking artists to develop happenings and reflections for a new life – and then request that thousands of participants implement them – Wooloo.org aims beyond the traditional art exhibition to become an active organizer of experiments in civic engagement and social empowerment. Lake, a journal which publishes contemporary art that engages with ecological issues. Artist as Citizen, connecting art students with donors to help them create projects on social issues. Get the work of Thomas Moran, Henry Jackson and Subhankar Banerjee.